"Every man has his technique, and they're all different. But when you know mine... you'll be dead". The Short Version: Wang Yu's extravagant Martial World/Kung Fu hybrid is essentially his ONCE UPON A TIME IN THE EAST; both an in-name only sequel to his Shaw Brothers directorial debut and a flashier do-over of his ONE ARMED BOXER movies with an added historical context. Wang's title boxer is a cartoonish, near-invincible hero who is always one step ahead of everybody else. The first 30 minutes promise an epic but Ku Long's convoluted script betrays itself almost immediately--veering away from jingoism to endless, increasingly wacky fighting sequences, and back again. A plethora of colorful characters and some misplaced flashbacks keep things confusing. Despite minor obstacles and repetitiveness of past flicks, the actor's last time in the director's chair is Kung Fun all the way. A mixed bag, but the sort of bag that's filled with candy in the form of Kung Fu zombies, a pistol packin' Lung Fei, a hot female ninja, and an army of steam powered Wang Yu dummies.... so dig in if you've a martial arts sweet tooth. The Japanese plot to infiltrate China and take over from within by ingratiating themselves with General To, an easily manipulated military leader who fancies swords. Kitsu, a member of the Izu Clan, is sent along with a female ninja to meet with the General and deliver him a gift of two special Japanese samurai swords--gradually setting the invasion of China in motion. Learning of this, a loyalist sends his niece to alert the righteous General Shang Ta and deliver to him a pair of swords and two pearls as a gift. They're ambushed by the Japanese on their way, but saved by a mysterious man possessing great kung fu skills. Discovering he's the Rapid Fist, Tsao Pai Leung, the Japanese seek out the one fighter who can defeat him, another Japanese proficient in guns and weapons named Black Crane. In many cases, Jimmy Wang Yu movies are interchangeable in terms of the scenarios and his character portrayals. Always containing varying levels of Grand Guignol nuttery, the violence and bloodshed frequently challenged the Shaw's trademark brutality in sheer excess. As for Wang Yu's characters, they either incur an unbelievable amount of punishment; or come away with barely a scratch. There's not a lot of gore in RETURN OF THE CHINESE BOXER, but there's a surplus of insanity to go along with Wang Yu's Warner Brothers cartoon of a hero who is constantly one step ahead of the bad guys. The title may imply a 'return' of his Chinese Boxer from the Shaw Brothers favorite, but it's a different character entirely... even though Wang's Rapid Fist Tsao Pai Leung could be any of the dozens he played before it. As far as the English export title is concerned, the famous HK personality is simply capitalizing on the earlier picture with the only similarity being he produced and directed both of them. Wang Yu is a much better director than he probably ever got credit for, and there's signs of it here; despite an all-too familiar plot that unravels in fractured fashion. 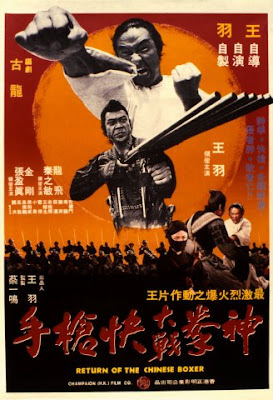 The actor yet again melds his two hits, THE CHINESE BOXER (1970) and ONE ARMED BOXER (1972)--the latter of which was a Kung Fu combo of the former title and Wang's career-making movie from 1967, ONE ARMED SWORDSMAN. Director Wang again delivers a pseudo-remake, but frames a Qing Era-Japanese invasion plot around a basic Fist and Kick narrative. Judging by the way the movie plays out, it would appear Wang Yu may have had a hand in the film's script, too. Written by Ku Long (also listed as Gu Long), a famous and prolific writer of Wuxia epics, his script is neither as intricate nor as linear as some of his more popular works--particularly for Shaw Brothers Studio. The standard China vs. Japan motif contains little in the way of political machinations that ultimately get distracted by the cavalcade of Kung Fu battles. The Fist & Kick equivalent of a Wuxia story, BOXER is filled with an enormous amount of characters despite the paper thin plot line. Curious editing decisions give the impression the film may have run into either financial problems or Jimmy Wang Yu's ego. A confusingly placed flashback (involving the death of a Jujitsu fighter) and the last minute significance of a pair of swords and two pearls get lost in translation. Born July 7th, 1938, Ku Long (real name Hsiung Yao-hua) began writing in 1955. While still in High School, his first published work, 'From the North to the South', had no martial arts. By 1960, he would begin his successful career novelizing the adventures of romantic, scholarly swordsmen using his own personal interests in poetry and foreign culture to formulate a unique writing style. Eventually, his writing would be turned into movies and television programs. The Shaw Brothers and director Chu Yuan put the Wuxia genre back into the limelight in 1976 with KILLER CLANS, the film version of Ku Long's classic 1971 novel, 'Meteor, Butterfly and Sword'. Over a dozen more of Ku's works were adapted for the big screen by Chu Yuan; not to mention dozens of others turned into movies by other directors. Ku Long even adapted his own novels for the screen in addition to scripts specifically written for the celluloid medium. He contracted liver disease in 1977 and passed away at only 47 years of age in 1985 from Cirrhosis of the Liver. Ku Long's penmanship graces many of the genres best works. At the 32 minute mark, the film stops dead in its tracks for a flashback tournament sequence. Using an almost identical set to the one from MASTER OF THE FLYING GUILLOTINE (1976), what follows is a 12 minute action set piece where we're introduced to a slew of martial artists--all with their own unique fighting style. Adding little to the storyline other than to introduce two fighters who will figure into the plot later on, it's just an excuse to pad the running time. It's the best kind of padding, though. This is a KF movie, after all. The choreo in this sequence is exquisite and varied featuring a gallery of HK cinema familiars like Jack Long (THE 7 GRANDMASTERS ), Sun Jung Chi (MONKEY FIST, FLOATING SNAKE ), and Philip Ko (TIGER OVER WALL )--all fighting each other to the death. Genre fans will love this 12 minute marathon of martial mayhem--seeing some of the Kung Fu genres notable masters beating the hell out of one another. The fighters are further distinguished by their costumes and weaponry--some of which are intricate in design. The film's action director, Hsieh Hsing (he makes his entrance in the exact same way Lung Fei does in MOTFG), plays the Jujitsu expert, Kin Po. Hsieh Hsing's action design is the glue that holds the picture together. Some of the fights are ambitious--evidenced in an impressive train assault near the beginning and a sequence shortly thereafter wherein Wang Yu is trapped inside an old shack while the Japanese bring it down with hooks tied to ropes. As the film progresses, the action becomes more insane with the film adding increasingly kookier elements. In some ways, the serious tone being innocuously replaced by a fantasy-oriented one works to its advantage. Hsieh Hsing co-choreographed many of Chang Cheh's Taiwan offerings when he made a dozen movies there using Shaw capital that couldn't be extracted; some of these include MARCO POLO (1975), SEVEN MAN ARMY (1976), and THE NAVAL COMMANDOS (1977). He'd previously designed the fights on the Taiwan-lensed Shaw Fist and Kicker, THE CHAMPION (1973) starring Shih Szu and Chin Han. Compared to his previous works with a Nipponese slant, Wang Yu's Japanese influence is even stronger this time out. They're never referred to as ninja, but Ku Long's script finds room for them--mainly in the form of a Kunoichi (female ninja) played by the alluring Emily Cheung Ying Chan in an early role. Bad guys (and girls) is something RETURN OF THE CHINESE BOXER has an abundance of. Well known for his antagonist roles, Lung Fei gets one of his most charismatic turns as the gun-toting Black Crane, a Japanese specialist in pistols and rifles. He's a literal 'Gun Fu' expert; carrying an 8-barreled rifle and wearing a costume covered in flintlock pistols. Lung worked with Wang Yu on a number of his Taiwanese made Fist and Kick flicks, one of the most famous being THE ONE ARMED BOXER released in 1972. In that plotless epic Lung Fei played the lead heavy, a Japanese with unkempt hair and vampire teeth! Wang Yu's movies from this period could be counted on to deliver some of the nuttiest imagery you've ever seen. There are no vampiric villains or fighters with elongated arms, but there are Kung Fu zombies and a warehouse full of steam-powered Wang Yu robots! At the beginning he's seen practicing Dummy Kung Fu--catching arrows in mid-air and Kung Fu-ing dummies from one end of a gym to the other. Elsewhere you'll see Wang walking up walls; and standing, single-legged, atop a pole wielded by Kam Kong--who played the evil blind priest in the schizophrenic ONE ARMED BOXER sequel, MASTER OF THE FLYING GUILLOTINE (1976). English dub fans are again treated to some funny lines. One of the best is uttered within the opening minutes by a subdued Chen Ti Men, the constant cackle master of the same year's THE DEADLY SILVER SPEAR (you'll recognize the same cave set, too). Playing the Japanese lord who sets up the plot with this marvelous conversation starter, "I've invited you all here... to discuss things.... mainly the question of Chiner... amongst others..."; then there's classic dubbed Tough Guy dialog too like, "No one beats The Claw! Come on!" Many of Wang Yu's movies leave a lot to be desired, but his directorial efforts are well made productions even if most of the time he was cloning hits from Shaw Brothers, the company that made him famous. If you're already a fan of the actor, this picture comes highly recommended. It's not quite on the level of some of his other directed works like THE CHINESE BOXER (1970), THE BRAVE AND THE EVIL (1971), or THE SWORD (1971), but there's little denying this was intended to be Wang Yu's magnum opus.... and in many ways, he has succeeded in designing a love letter to his fan-base encapsulating all the best elements of his past career.